A chart designed like the periodic table of elements can help you decide which ones, or which mixtures, to grow. Agronomists at the USDA ARS Northern Plains Research Laboratory in Mandan, N.D., have created a chart to help you learn about different cover crop options. The chart includes information about 46 crop species that may be planted individually or in cocktail mixtures. Information on growth cycle, relative water use, plant architecture, seeding depth, forage quality, pollination characteristics, and nutrient cycling are included. The chart is designed like the periodic table of elements. You can select individual crop species by clicking on the name, which will direct you to additional information about the selected crop. Icons within each crop page return the user to the chart, thereby easily allowing comparisons of different crops. Information on specific crops is occasionally generalized and/or approximate, and may not reflect performance in on-farm conditions. Accordingly, USDA-ARS makes no guarantee to the performance of specific crops based on information provided in the chart. 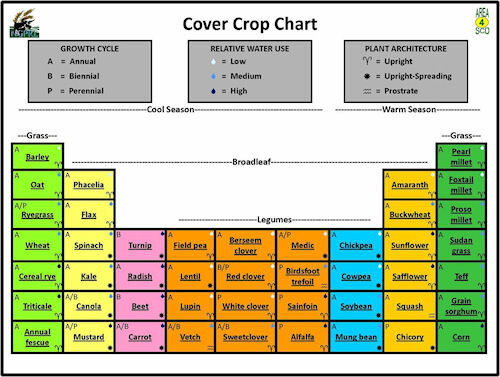 The Cover Crop Chart is produced and distributed by the staff of the USDA-ARS NGPRL, Mandan, ND. Mark Liebig and Holly Johnson contributed to the design and content of the chart with input from NGPRL staff and producers and technicians from the Area IV Soil Conservation Districts of North Dakota and NRCS staff at the Bismarck and Dickinson Field/Area Offices. Click here for the chart: www.ars.usda.gov/Services/docs.htm?docid=20323.